The disaster occurred at the Purity Distilling Company facility on January 15, 1919. The temperature had risen above 40 °F (4 °C), climbing rapidly from the frigid temperatures of the preceding days. :91, 95 Molasses can be fermented to produce ethanol, the active ingredient in alcoholic beverages and a key component in munitions. :11 The stored molasses was awaiting transfer to the Purity plant situated between Willow Street and Evereteze Way in Cambridge. Anthony di Stasio, walking homeward with his sisters from the Michelangelo School, was picked up by the wave and carried, tumbling on its crest, almost as though he were surfing. Then he grounded and the molasses rolled him like a pebble as the wave diminished. He heard his mother call his name and couldn't answer, his throat was so clogged with the smothering goo. He passed out, then opened his eyes to find three of his four sisters staring at him. Local residents brought a class-action lawsuit against the United States Industrial Alcohol Company (USIA) which had bought Purity Distilling in 1917. It was one of the first class-action suits in Massachusetts and is considered a milestone in paving the way for modern corporate regulation. The company claimed that the tank had been blown up by anarchists:165 because some of the alcohol produced was to be used in making munitions, but a court-appointed auditor found USIA responsible after three years of hearings, and the company ultimately paid out $628,000 in damages ($9.08 million in 2018, adjusted for inflation). Relatives of those killed reportedly received around $7,000 per victim (equivalent to $101,000 in 2018). Cleanup crews used salt water from a fireboat to wash away the molasses and sand to absorb it, and the harbor was brown with molasses until summer. The cleanup in the immediate area took weeks, with several hundred people contributing to the effort,:132–134, 139 and it took longer to clean the rest of Greater Boston and its suburbs. Rescue workers, cleanup crews, and sight-seers had tracked molasses through the streets and spread it to subway platforms, to the seats inside trains and streetcars, to pay telephone handsets, into homes,:139 and to countless other places. "Everything that a Bostonian touched was sticky." Several factors might have contributed to the disaster. The tank was constructed poorly and tested insufficiently, and carbon dioxide production might have raised the internal pressure due to fermentation in the tank. Warmer weather the previous day would have assisted in building this pressure, as the air temperature rose from 2 to 41 °F (−17 to 5.0 °C) over that period. The failure occurred from a manhole cover near the base of the tank, and a fatigue crack there possibly grew to the point of criticality. The tank had been filled to capacity only eight times since it was built a few years previously, putting the walls under an intermittent, cyclical load. Several authors say that the Purity Distilling Company was trying to out-race prohibition, as the 18th amendment was ratified the next day (January 16, 1919) and took effect one year later. An inquiry after the disaster revealed that Arthur Jell, USIA’s treasurer, neglected basic safety tests while overseeing construction of the tank, such as filling it with water to check for leaks, and ignored warning signs such as groaning noises each time the tank was filled. He had no architectural or engineering experience. When filled with molasses, the tank leaked so badly that it was painted brown to hide them. Local residents collected leaked molasses for their homes. A 2014 investigation applied modern engineering analysis and found that the steel was half as thick as it should have been for a tank of its size, even with the lax standards of the day, and it also lacked manganese and was made more brittle as a result. The tank's rivets were also apparently flawed, and cracks first formed at the rivet holes. In 2016, a team of scientists and students at Harvard University conducted extensive studies of the disaster, gathering data from many sources, including 1919 newspaper articles, old maps, and weather reports. The student researchers also studied the behavior of cold corn syrup flooding a scale model of the affected neighborhood. The researchers concluded that the reports of the high speed of the flood were credible. Two days before the disaster, warmer molasses had been added to the tank, reducing the viscosity of the fluid. When the tank collapsed, the fluid cooled quickly as it spread, until it reached Boston's winter evening temperatures and the viscosity increased dramatically. The Harvard study concluded that the molasses cooled and thickened quickly as it rushed through the streets, hampering efforts to free victims before they suffocated. United States Industrial Alcohol did not rebuild the tank. The property formerly occupied by the molasses tank and the North End Paving Company became a yard for the Boston Elevated Railway (predecessor to the Massachusetts Bay Transportation Authority). It currently is the site of a city-owned recreational complex, officially named Langone Park, featuring a Little League Baseball field, a playground, and bocce courts. Immediately to the east is the larger Puopolo Park, with additional recreational facilities. The accident has since become a staple of local culture, not only for the damage the flood brought, but also for the sweet smell that filled the North End for decades after the disaster. 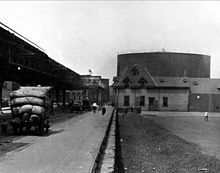 According to journalist Edwards Park, "The smell of molasses remained for decades a distinctive, unmistakable atmosphere of Boston." On January 15, 2019, for the 100th anniversary of the event, a ceremony was held in remembrance. Ground-penetrating radar was used to locate the exact location of the tank from 1919. The concrete slab base for the tank remains in place approximately 20 inches below the surface of the baseball diamond at Langone Park. Attendees of the ceremony stood in a circle marking the edge of the tank. The 21 names of those who died in, or as a result of, the flood were read aloud. Many laws and regulations governing construction were changed as a direct result of the disaster, including requirements for oversight by a licensed architect and civil engineer. One of the DUKW amphibious tourist vehicles operated by Boston Duck Tours has been named Molly Molasses in remembrance of the event, per the firm's practice of naming their DUKWs after famous Boston locations, events, and other bits of local culture. The Great Molasses Flood was also the theme of the 2019 MIT Mystery Hunt. Puleo, Stephen (2004). Dark Tide: The Great Boston Molasses Flood of 1919. Boston: Beacon Press. ISBN 0-8070-5021-0. ^ Hinrichsen, Erik (September 8, 2010). 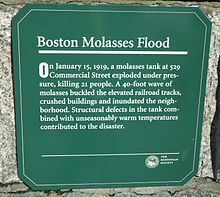 "The Boston Molasses Disaster: Causes of the Molasses Tank Explosion". Bright Hub. Retrieved March 5, 2019. ^ "'Molasses Disaster' Featured at Evening at 74 – Beacon Hill Times". beaconhilltimes.com. Retrieved March 5, 2019. 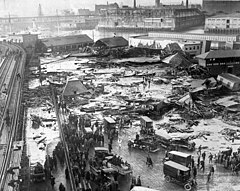 ^ "Great Molasses Flood: US marks 100 years since deadly wave of treacle trashed part of Boston". Associated Press. South China Morning Post. January 14, 2019. Retrieved March 18, 2019. ^ a b "Density: Molasses, and links to volume/weight conversions". Aqua-Calc. Retrieved January 18, 2019. ^ a b c d e Sohn, Emily (January 15, 2019). "Why the Great Molasses Flood Was So Deadly". The History Channel. A&E Television Networks. Retrieved January 16, 2019. ^ a b c d e f g h i Park, Edwards (November 1983). "Without Warning, Molasses in January Surged Over Boston". Smithsonian. 14 (8): 213–230. Retrieved March 24, 2013. Reprinted at Eric Postpischil's Domain, "Eric Postpischil's Molasses Disaster Pages, Smithsonian Article", June 14, 2009. ^ a b c d e f g h Puleo, Stephen (2004). Dark Tide: The Great Boston Molasses Flood of 1919. Beacon Press. ISBN 0-8070-5021-0. ^ a b c d Kesslen, Ben (January 14, 2019). 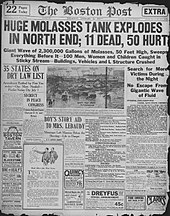 "The Great Boston Molasses Flood of 1919 killed 21 after 2 million gallon tank erupted". NBC News. Retrieved January 14, 2019. ^ Jabr, Ferris (July 17, 2013). "The Science of the Great Molasses Flood". Scientific American. Retrieved October 16, 2013. ^ Park, Edwards (December 19, 2018). "Without Warning, Molasses in January Surged Over Boston". edp.org. edp.org. Retrieved March 24, 2019. ...imagine an estimated 14,000 tons of the thick, sticky fluid running wild. It left the ruptured tank in a choking brown wave, 15 feet high, wiping out everything that stood in its way. One steel section of the tank was hurled across Commercial Street, neatly knocking out one of the uprights supporting the El. ^ a b Buell, Spencer (January 12, 2019). "Anarchists, Horses, Heroes: 12 Things You Didn't Know about the Great Boston Molasses Flood". Boston Magazine. Retrieved January 14, 2019. ^ a b "12 Killed When Tank of Molasses Explodes" (PDF). The New York Times (published January 16, 1919). January 15, 1919. ISSN 0362-4331. Retrieved May 30, 2008. ^ a b c Betancourt, Sarah (January 13, 2019). "The Great Boston Molasses Flood: why the strange disaster matters today". The Guardian. ISSN 0261-3077. Retrieved January 14, 2019. 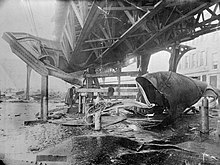 ^ "The Great Boston Molasses Disaster of 1919". The Hour. United Press International. January 17, 1979. ^ Andrews, Evan (January 13, 2017). "The Great Molasses Flood of 1919". The History Channel. A&E Television Networks. Retrieved December 21, 2017. ^ Mason, John (January 1965). "The Molasses Disaster of January 15, 1919". Yankee. Reprinted at Eric Postpischil's Domain, "Eric Postpischil's Molasses Disaster Pages, Yankee Magazine Article", June 14, 2009. Retrieved June 8, 2014. ^ "'There was no escape from the wave': These are the 21 victims of the Great Boston Molasses Flood". Boston.com. January 13, 2019. Retrieved January 14, 2019. ^ Puleo, Stephen (2010). Dark Tide: The Great Molasses Flood of 1919. Beacon Press. p. 79. Any disruption at the tank could prove disastrous to his plan to outrun Prohibition by producing alcohol as rapidly as possible at the East Cambridge distillery. ^ Stanley, Robert (1989). "Footnote to History". Yankee. 53: 101. In January of 1919 Purity Distilling Company of Boston, maker of high-grade rum, was working three shifts a day in a vain attempt to outrun national Prohibition. ^ Silverman, Steve (2001). Einstein's Refrigerator: And Other Stories from the Flip Side of History. Andrews McMeel. p. 37. ISBN 978-0-7407-1419-1. First, it was believed that the tank was overfilled because of the impending threat of Prohibition. ^ Streissguth, Thomas (2009). The Roaring Twenties. Infobase. p. 13. ISBN 978-1-4381-0887-2. ^ Adams, Cecil (December 31, 2004). "Was Boston once literally flooded with molasses?". The Straight Dope. The Chicago Reader. Retrieved December 16, 2006. ^ Schworm, Peter (January 15, 2015). "Nearly a century later, new insight into cause of Great Molasses Flood of 1919". The Boston Globe. Retrieved January 16, 2015. ^ a b "Slow as molasses? Sweet but deadly 1919 disaster explained". Boston.com. Associated Press. November 24, 2016. Retrieved December 3, 2016. ^ a b c d Mccann, Erin (November 26, 2016). "Solving a Mystery Behind the Deadly 'Tsunami of Molasses' of 1919". The New York Times. Retrieved December 3, 2016. ^ "Molasses Creates a Sticky Situation". AlphaGalileo. November 17, 2016. Retrieved November 25, 2016. ^ Sharp, Nicole; Kennedy, Jordan; Rubinstein, Shmuel (November 21, 2016). "Abstract: L27.00008 : In a sea of sticky molasses: The physics of the Boston Molasses Flood". Bulletin of the American Physical Society. 61 (20). Retrieved November 25, 2016. ^ Harris, Patricia; Lyon, David (2004). Boston: a Guide to Unique Places. The Globe Pequot Press. pp. 63–64. ISBN 0-7627-3011-0. 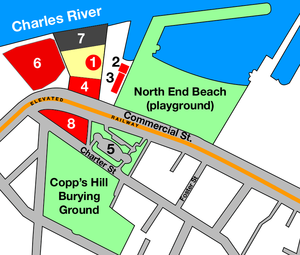 ^ "Places to go: Downtown/North End". The Boston Harbor Association. Archived from the original on September 13, 2013. Retrieved September 5, 2013. ^ Ocker, J.W. (2010). The New England Grimpendium. Woodstock, VT: The Countryman Press. p. 97. ISBN 978-0-88150-919-9. ^ Sweeney, Emily (January 15, 2019). "Boston officials remember the Great Molasses Flood, 100 years later". The Boston Globe. Retrieved January 26, 2019. ^ adamg (January 15, 2019). "Gathering around the site of the molasses tank to remember its victims". Boston, Massachusetts. Retrieved January 26, 2019. ^ Durso, Fred (May 1, 2011). "The Great Boston Molasses Flood". NFPA Journal. ^ Baker, Billy (November 11, 2014). "Old Army trucks find a home — and triage". Boston Globe. ^ "Guide to the Holiday Forest". The MIT Mystery Hunt. Retrieved January 27, 2019. Boston Public Library. Photos related to the event on Flickr. Many phrases are direct quotes. Interview with Stephen Puleo, author of the book listed in "Further reading"
This page is based on the Wikipedia article Great Molasses Flood; it is used under the Creative Commons Attribution-ShareAlike 3.0 Unported License (CC-BY-SA). You may redistribute it, verbatim or modified, providing that you comply with the terms of the CC-BY-SA.